ther $100 million of the U.S.
Hess died last Monday (Aug.
off from the main highways. respective UJA Young Leadership Cabinet retreats. on the National cabinet were Bill Kalish and Sandy Mahr. reenrollment function. It is at the home of Dr. and Mrs.
Achievement Academy has announced that Suzanne E.
attends Berkeley Prep, is the daughter of Mr. and Mrs.
.Leonard Gilbert and granddaughter of Mr. and Mrs.
Buchman, of Tampa. Truly outstanding, Suzanne. further. WAY TO GO, TEAM! Aug. 19. Happiness to all of you! and golf in his free time. Welcome! way he is viewed by others. from the viewpoints of others. creates a picture of himself." citement what the school is. Studies on the secondary level. from two to nine hours a week. for a central high school. ning of the school term. education on the college level. Talking With Rabbi Rose . not have at this point). there is a full program. trait of this "new order" rabbi. minds of 12 and 13 year olds. relate to it as an adult. social outlet for the children. joy and thrill of being Jewish. Make It An Affair They Will Never Forget! and influence on his life. took with Dr. Samuel T.
backs the works with action. lot of time to succeed. to this type of extracurricular program? children ages three and four. <* The Merchandise Awvertiaaa la Iu Class. For example (see right): Mr.
assets in excess of $2.3 million. of his age and poor health. tional dishes will be offered. stop and have a "shmooz"
7:30 p.m. Tampa Bay Jewish Singles Games Night at. person that they want to be,"
children, going out to Jr. High. ed a Masters of Social Work. the College of Social Work! Session 1 and 2: Sept. 8-Dec.
2nd Session: Oct. 26-Dec. 11.
our staff as a tennis instructor. Wager 989-0970 for further information. 4 Weeks Mondays 7 p.m.
on Saturday evening, Aug. 22.
and the granddaughter of Mrs.
this year's event the best ever. Dora, and by Gloria Barr. with a luncheon, and Lewis H.
was given by Mr. and Mrs.
K. Nelson III, and Mrs. B.
Nelson Stephens. Mr. and Mrs.
George Bentley, Mr. and Mrs.
ficer of the First Florida Bank. Special consideration tor those unabla to pay. convenient locations and you, a relative. Lon of Mr. and Mrs. Michael S.
.ill be hosted by Mr. and Mrs.
t. Cohen and Mr. and Mrs.
Saturday, Sept. 12 at 10 a.m. In honor of the occasion Dr.
Mrs. Richard Rudolph and Dr.
and Kara, Providence. RI; Mr.
Hallandale, Fla.; Mr. and Mrs.
Atlanta, Ga.; Mr. and Mrs.
Brooklyn, NY; Dr. and Mrs.
and Kim of Lakeland, Fla.
on Friday, Sept. 11 at 8 p.m.
tor Sam Isaak will officiate. direction of Rabbi T. Brod. special touch to the occasion. at 11:00 for your convenience. on Friday, Sept. 18, at 8 p.m.
Saturday, Sept. 19 at 7:30 p.m.
to a year of exciting events. is coming up for the Holidays. cuit Court on Sept. 16. Wild wood Restaurant, 1241 E.
Ami. Our speaker will be Dr.
join us for a delightful evening. 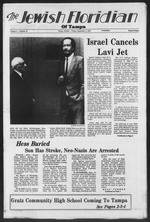 sional staff, including Rabbi H.
Ave. The time will be 9:45 a.m.
2541907 or 839-5980 for location of services. 13801 N. 37h St. No. 1114. Rabbi Dovid Mockin, Program Coordinator. 971-6234.
lenter, 301 S. Jupiter Ave.
0212A 3rd St. North, St.
ogether beginning at 11 a.m.
ple B'nai Israel, 1685 S.
fice at 963-2317 or 980-0942. Young Israel of Tampa Founded . success of the Young Israel. Wednesday night at 8 p.m.
ritual washing of the bodies. ing and wash the female dead. numerical value of Chai (Life). In the Talmud: R. Hiyya B.
children, Andrew .1. Berger and Robert K.
Berber. Tampa, Cynthia D, MTfir, I >..
ander R. Berger and Benjamin A. Berger. town that attended to burials. allowed for you to work. came to comfort the mourners. refers to the "Open Space"
Open Space behind the house.
' moment ot death until burial.
. help In this sacred work. If you wish to volunteer, we will train you. at ushering in the year 5748.
for a "College Bound Brunch"
make it a picture-perfect occasion. ;on of Mr. and Mrs. Michael S.
A'ill be hosted by Mr. and Mrs.
pi. Cohen and Mr. and Mrs.
4005 WMt CyprM* St. 6375 Hirn.y Rd. Spec/a/ consideration for those unable to pay.